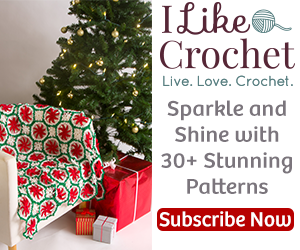 I really hope you enjoy this pattern, there are endless possibilities with this stitch and I have to say, I have personally enjoyed working it at least 4 times over now! Before you get started, please consider subscribing to YarnWars to be the 1st to know when a new FREE pattern comes around along with our many contests and Mini-Challenges we run on our Facebook Page & in our Group! Over on the right, you will see a subscribe box, all you need to do is enter your email address, a confirmation will come to your email that you simply need to click on to confirm your subscription, it’s that easy! We won’t make you fill out any lengthy forms to get our updates! We promise not to spam your email and your email privacy is very important to us! There is a FULL Video tutorial for this Tuscany Bag crochet pattern. Separate areas of pattern may also be highlighted throughout the written pattern to help with certain sections of the pattern. Those links will take you to the specific section of the video that goes over that particular area stated. Otherwise, to reach this FREE pattern now, via our Website CLICK HERE!